Meet Laura Fantacci, stylist, former fashion editor, co-founder of Wardrobe ICONS and devoted mother of two. Discover her journey from fashion journalism into full-time blogging, her seasonal jewellery picks and her expertly edited essentials. You began your career as Fashion Editor for Red magazine, then you took a leap of faith blogging full time via Wearing It Today (WIT) and since then you've co-founded Wardrobe ICONS. What gave you the confidence and drive to establish your own brand? I felt like at the time I left Red Magazine there was more interest in me as a blogger than as a fashion editor. It was quite a scary decision but I felt that brands and also my readers had more belief in what I would say when it was written on my blog rather than when it was on the pages of Red Magazine, which made me think I wanted to have a more direct communication with my audience. The confirmation of that was when I did a post on what could be improved with my blog and I received countless answers; most of them were asking to see more about me and my life. I felt there was more of a need to do something personal and that's when I left Red to focus WIT Blog. I started Wardrobe ICONS because I personally felt the need to continue being a fashion editor. I didn't want to just move to the blog side where everything was concentrated on me; I had interests as a fashion editor - other designers and people in the industry - and I felt that having Wardrobe ICONS would allow me to still have a voice as a fashion editor. The concept behind Wardrobe ICONS is to show people what never goes out of fashion, favouring forever-pieces over quick-fix fashion. Which pieces of jewellery would you recommend to complement a timeless look? 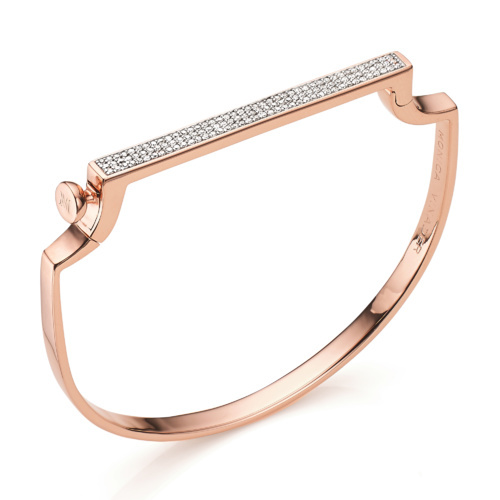 I think a gold bangle is something that you'll wear again and again; that would be one of my top five. A pair of small diamond studs, just a little accent in your ear is something that you'll never get bored of. 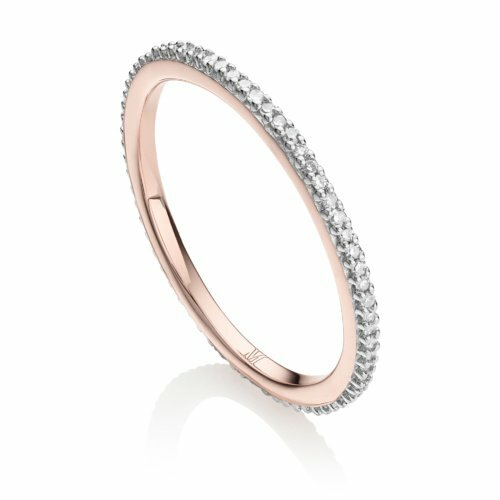 I personally love stacking eternity rings. You can buy them yourself for an occasion or receive them from your friends or your husband and you can keep giving a meaning to each one of them; they are just so delicate and beautiful. A small dainty necklace is something that you can wear in the summer and layer more than one. It's important to have a piece of jewellery that dresses up your outfit instantly, so if you're wearing jeans and a white t-shirt, maybe pair it with chandelier earrings, something big and bold that really adds a bit of oomph to your outfit. 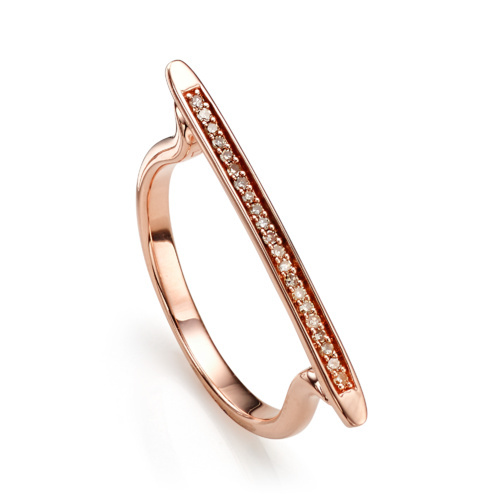 Do you find that the season and the weather reflect how you wear your jewellery? Definitely! I find that the moment the sun comes out I start piling bracelets on. You're usually wearing short sleeves in the warmer months, you have a bit of a tan, and it just says summer to me to have a wrist full of bracelets. It's the same for delicate necklaces; in the summer you're more likely to be wearing an open shirt or something that reveals a bit more skin and I think that layering small pieces is so beautiful. 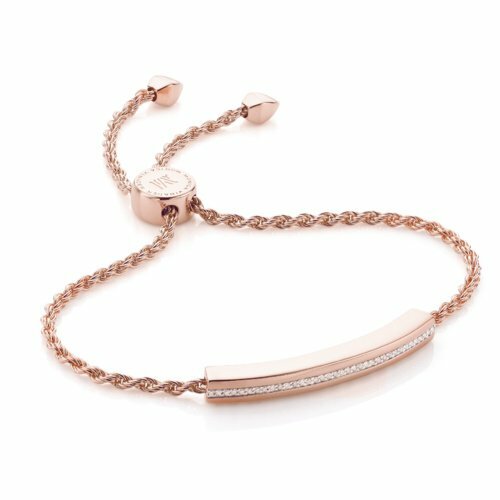 I love rose gold against tanned skin as well. In the winter I wear a lot more earrings, big or small, with chunky jumpers and knits. Rings I don't wear as many but I get fixated on one or two and wear them all the time but I find earrings, necklaces and bracelets that I'm tempted by. Laura Fantacci wearing our new Nura Teardrop Jacket earrings. 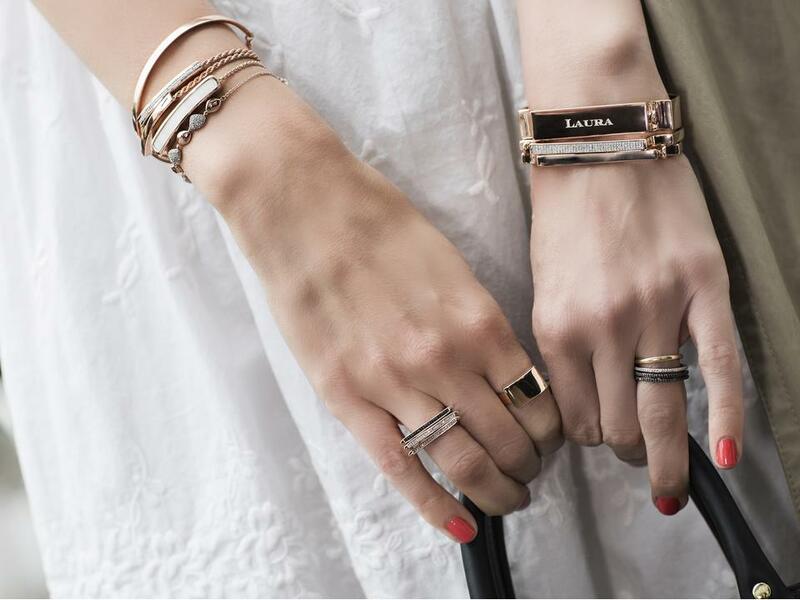 Laura, self-styled in a selection of Nura, Baja, Linear and Fiji bracelets paired with a stack of Signature bangles. How has WIT Blog helped you in successfully running Wardrobe ICONS? I don't think I would have ever started Wardrobe ICONS if I hadn't have feedback from my WIT Blog readers. I started it was because most women in their late 20s and 30s who followed me within the WIT Blog had this desire to build a perfect wardrobe, a really cohesive, intelligently edited wardrobe that would work for the rest of their lives as opposed to just the pieces of the moment. It was through them that Wardrobe ICONS started and I only have them to thank. Are you still running WIT Blog at the moment? The WIT Blog is on hold, it was a goodbye, not an 'adio' as we say in Italian! I stopped it in May last year when I was pregnant and then I was running Wardrobe ICONS alone for 6 months while Petro had her baby. I felt like I couldn't physically give the attention to both so I put it on hold. It was the right decision at the time, but a year has passed and I confess that I do sometimes think that it could come back with a slightly different focus. It used to be about what I was wearing every day at a time where we didn't have Instagram and live video; it was the only way to show what I was wearing. I don't think it will come back in the same form, as people can see what I'm wearing every day on my Instagram. It might come back as a more personal tool to, so watch this space! London is a very competitive City, how do you make sure Wardrobe ICONS stands out in such a busy market? We really just do what we love. I try not to think about the competition too much as I feel like you can drive yourself mad doing that. We try to stay true to our philosophy of 'expertly edited essentials' and be true to what are interested in and potentially what our readers could be interested in. Petro and I are both ex-fashion editors and we've done this job before which means we know what might work in these women's wardrobes. At the moment we just want to produce the best possible content and in the most professional way possible. Keeping up with the times is also important. We'll be relaunching the Wardrobe ICONS website at the end of May; it's going to be much easier to navigate and will be responsive; that's one of the first steps into a new era for us. After blogging alone for two years, you collaborated with Petro Stofberg to establish Wardrobe ICONS. What do you feel are the benefits of working as a partnership? First of all it's a less lonely environment. You have somebody to go to press days with and someone who you can bounce ideas off. We have slightly different takes on what we think is a classic which is such a good thing in a world where not everyone is going to share my girly-ness for instance. Some people prefer Petro's slightly more androgynous, more pared back look. I think our readers have two very different people to relate to, but equally we both share this ICONS philosophy which keeps us together. I'm very lucky that Petro isn't just a business partner, she is also good friend and there is a certain amount of comradery to what we do - I love working with her. It was really lonely in the time without her during our respective pregnancies but we're back together now! It makes me feel very proud how we timed it actually and how we as women are able to have our own business have the children, attend to them and keep the business running. It's quite empowering to look back at this past year and see what we have achieved. Laura Fantacci captured in the iconic Westbourne Grove, London. Delicate white lace with rose gold details, worn by Laura in our London shoot. As a mother to two beautiful children, how would you say motherhood has changed you and do you have any tips for balancing motherhood with a thriving career? It definitely has changed me. I always say that 'done is better than perfect'; I'm a real perfectionist and struggle to attain to what I just said but motherhood forces you to. You cannot control things to the extent you want to, especially in the earlier years when they are little. It's very frustrating for someone who is used to running their ship in a certain way but it makes you a more flexible person and an easier going person. I was neither of those things but since having children, I've been told I'm easier to get along with because - it's changed me in a positive way. It also makes you relate to other women and mothers in a strong way, in a way that makes you have this sense of womanhood. It's hard to have that feeling before you have kids because of what you go through. I'm lucky that I have my business and my own rules. I work from home which means I'm around all the time. It doesn't mean that I have to do everything all the time but I can do a nursery pick up, I can take my daughter to ballet or I can take a moment to be with them. I'm not gone from 9.30 - 5.30 and that makes me really happy. There is a flip side, but it's a matter of communicating to your children when mummy is doing work and you shut the door and carry on. Also because I live abroad and I don't have any family here in London, I have an amazing nanny who is literally my right hand women. She allows me to take a day off to do this and that and I know they're in safe hands. I think I'm lucky in that respect and grateful of having the opportunity to do all that do because I have that help. 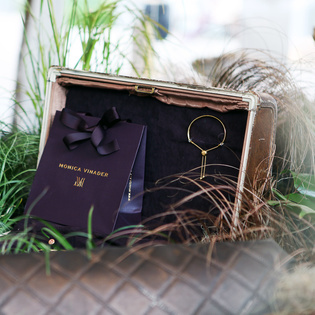 What are your go-to shopping destinations in London for high quality essentials that fit your chic aesthetic? There is a bit of a top five. A pair of leather leggings from Joseph, they are expensive so they are definitely an investment, but they virtually look good on any shape. You will wear them from now until you are 75! It's matter of paring them with the right shoe and top at the different stages of your life. They are so versatile and a real staple that you can wear all year round. I'm a huge fan of Chinti and Parker cashmere. I also love my Sophie Hulme bag, the Black Cromwell East West Shopper, because I can hold it by the handles or use the longer strap and it fits all the things I like to carry around. Bodas underwear, is another. Underwear is one of those things you forget about but it makes you feel comfortable and if you buy the right thing it can last you a long time. A red lipstick also always does the trick! You are originally from Italy, how to feel your Italian roots have influenced your style? I don't know that Italian style has influenced me, I think that British style has much more. I've been here for 20 years this year. When I go back I feel like the odd one out as Italian style is always a bit over the top. I feel like I'm a bit of a cross-breed. When I go back to Italy what I do love, is that classic Dolce & Gabbana black or white lace dress. Laura, pictured outside florist Wild At Heart in West London. 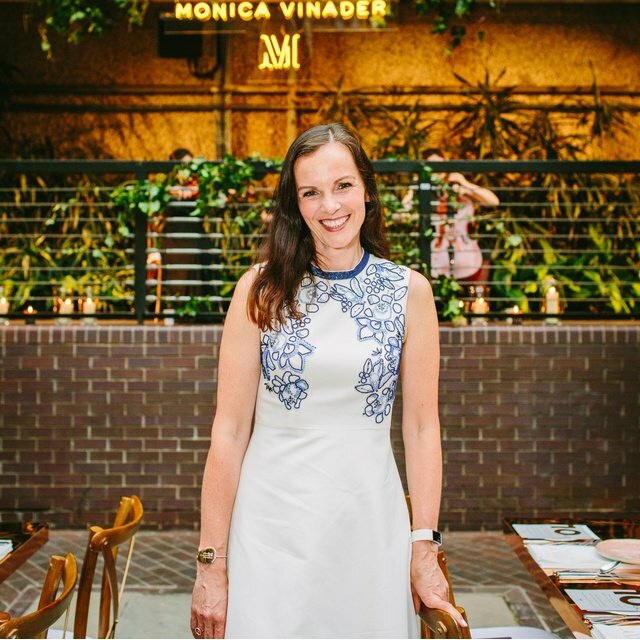 When and how did you first discover Monica Vinader? It was when I was starting out interning with Isabella Blow at Tatler magazine and I remember quite a lot of Monica Vinader pieces being called in for her shoots. When I became fond of it was a little later on when I became Fashion Editor at Red Magazine. I felt like the quality of the product and the price was really relevant for the Red reader and the jewellery was so versatile relevant to my pages whether I was doing a travel page and we'd include a Fiji bracelet or a Christmas page and you feature a glamorous earring. There was always something with a really good price point. The relationship really cemented years later when we started with Wardrobe ICONS and we did an event; and that felt like the completion of a long lasting relationship, it was such a lovely event and we had so many lovely readers come to it, it was really nice to see all our readers under one roof in the beautiful Chelsea store just before Christmas, it felt like the perfect coronation! How do you incorporate jewellery and accessories into your everyday style? Do you have a style preference; diamond, gemstones or plain pieces? I am more of a gold and rose gold person and I love them mixed together. I also love diamonds, anything pavé! When my daughter Greta was born, my aunt wanted to give her a really beautiful forever gift and I bought her the Monica Vinader Ava Disc diamond earrings and I saved them for her (I might have worn them a couple of times). I'm less of a gemstones person, but I do love layering; I very rarely just wear one thing. 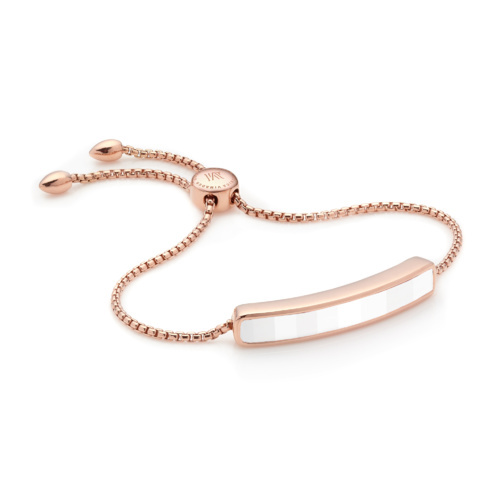 If you could have anything engraved on a Monica Vinader bracelet what would it be? It would be Greta Zita and Vera Gilda; I love their names and they were my grandmother's as well.